Free the Slaves is currently seeking a dynamic, organized, detail-oriented and highly-motivated candidate to fill the position of Major Gifts Director, a new position created due to organizational growth. He or she will work closely with the President, CEO and COO to support the acquisition, cultivation, solicitation and stewardship of major donors—whom Free the Slaves sees as key partners in combating slavery. The Major Gifts Director will also work closely with the Executive Producer/Communications Director and the Communications team to integrate consistent messaging throughout the organization’s external communications. This position will be based in the DC headquarters of Free the Slaves. Domestic and some limited international travel will be required. • Lead the cultivation, solicitation and stewardship of major donors and major donor prospects, including preparation, execution and follow-up for all visits. • Coordinate donor field visits with senior staff to Free the Slaves’ overseas programs, joining and participating as needed. • Integrate efforts into larger development strategy, working with other members of Development team to build annual membership program as well as leverage national volunteer base. In order to attract and retain professionals at the top of their fields, Free the Slaves provides a generous compensation package, including competitive salaries, vacation, personal time and employer-paid health insurance for the employee. Free the Slaves is an Equal Opportunity / Affirmative Action Employer committed to workplace diversity. 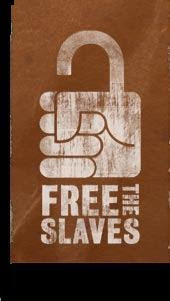 Free the Slaves is a non-profit, non-partisan organization dedicated to ending modern slavery worldwide. Founded in 2000, Free the Slaves is a dynamic, growing organization that has its headquarters in Washington, DC and satellite offices in Los Angeles, Delhi, Accra and Kathmandu. It has programs in Brazil, Ghana, Haiti, India, Nepal, Sudan and Uganda in addition to its work in the United States. See www.freetheslaves.net for more information. Applicants should send a resume, thoughtful cover letter, and one writing sample (preferably development-related, under 3pp) to careers@freetheslaves.net with ‘Major Gifts Director Search’ in the subject line. The closing date is October 23, 2009.